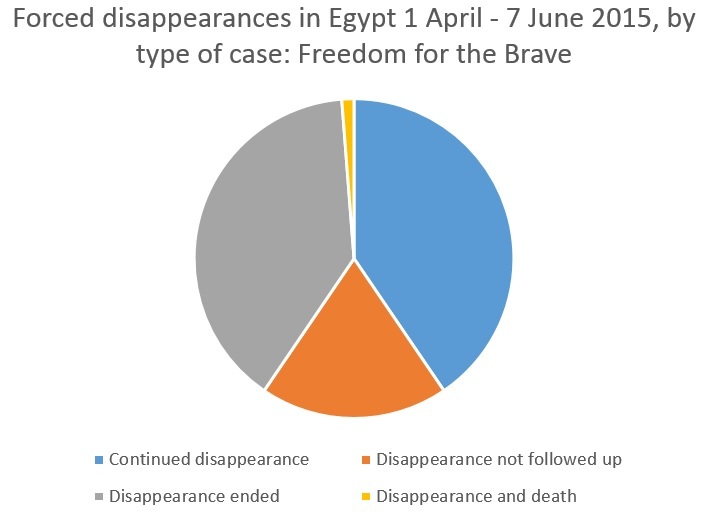 Prisoners’ rights group Freedom for the Brave has documented 163 cases of forced disappearance in Egypt since the first week of April 2015 and June 7, the campaign said in a statement on its Facebook page. Drawn from reports by the group’s extensive network of contacts with detainees’ families and human rights groups, as well as documentation from social media reports, the data will raise fears that the military regime is turning to tactics reminiscent of those used by the Argentinian junta during the Dirty War, when thousands of opposition activists were abducted and murdered. 2. Cases of “Forced disappearance not followed-up” – instances of the forced disappearance of a person from a certain place at a certain time where there has been no direct follow up or communication with their relatives, acquaintances, individuals or reporting bodies by Freedom for the Brave. 3. “Ended forced disappearance” – instances of forced disappearance of a person from a certain place at a certain time where the person has been confirmed to have reappeared. 4. “Forced disappearance and death” – instances where a person has disappeared from a certain place at a certain time, followed by the discovery of his body without any circumstantial developments regarding his reappearance following abduction. Dozens of activists were still missing, according to the campaign’s statistics, with some untraceable for over 50 days. 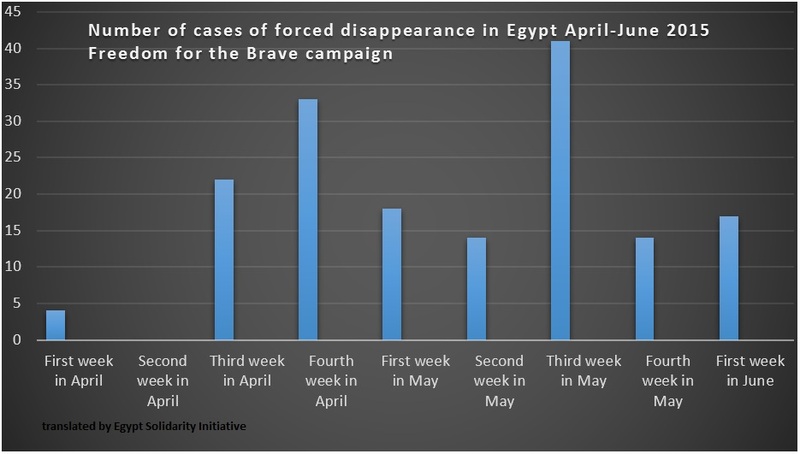 The numbers of disappearances accelerated sharply during May, reaching 41 cases during the third week. Read summaries of the English data online here. Read the full dataset in Arabic here. 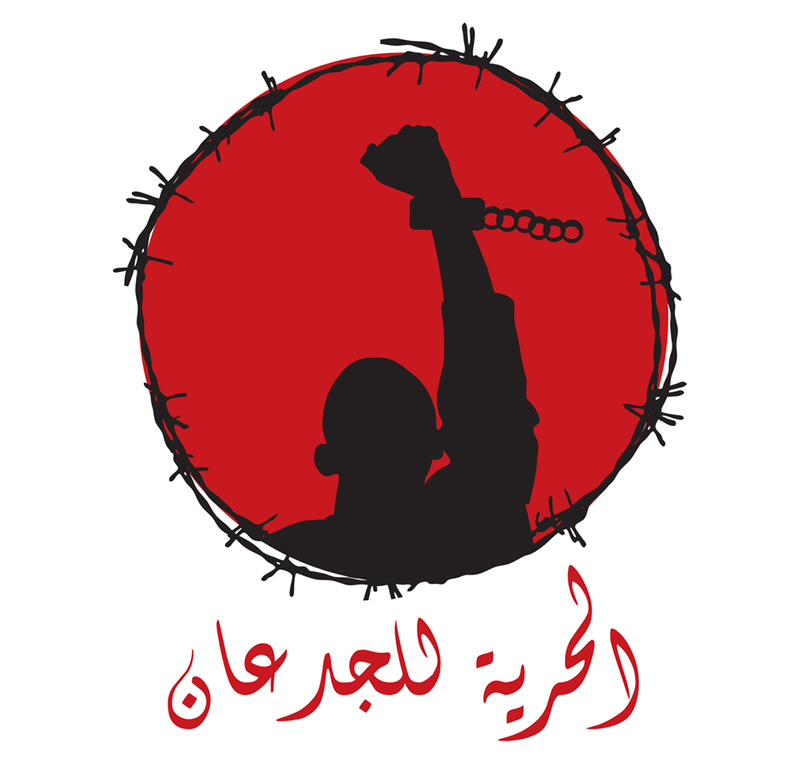 Join the protests against repression in Egypt and in solidarity with political prisoners and all those unjustly detained on 20-21 June. Find out more here.